Located on the south side of Warren Street are three of the finest examples of early twentieth century estate design in the city. The three homes were built for members of the Pruyn family, one of Glens Falls' most influential clans at the time. Samuel Pruyn, the family's patriarch, rose to prominence as one of the co-founders of Finch, Pruyn & Co. While the company served as a lumber supply business when it began operation in 1865, it expanded into the paper production industry in 1904, a move that would become an integral part of Glens Falls' economic foundation. Samuel and his wife, Eliza, had three daughters: Charlotte, Nell, and Mary in 1867, 1875, and 1879, respectively. During an eight year period, all three daughters had homes built on adjacent lots on Warren Street on the banks of the Hudson River and just down the road from their father's company. Each home was designed by Boston architect Henry Forbes Bigelow, and the trio is considered to be one of the few groupings of Bigelow's work that can be found outside of Boston. The home of Maurice Hoopes and Mary Pruyn Hoopes was built in 1904 and was designed in the Dutch Colonial Revival style. The middle home was built for Charlotte Pruyn Hyde and her husband, Louis, and was completed in 1912. Bigelow designed the two-story residence using Renaissance Revival characteristics. As with Hoopes House, Bigelow infused Dutch Colonial elements into his design for Nell Pruyn Cunningham's residence. Cunningham House was constructed in 1910-11. All three of the sisters' homes, plus the Finch, Pruyn & Co. office building also designed by Bigelow, are part of the Glens Falls Multiple Resource Area that was entered into the National Register of Historic Places in 1984. Charlotte and Louis Hyde were avid art collectors who aquired a vast array of pieces and displayed them in the home Bigelow designed for them. Their initial collection included many works by Old Masters (Botticelli, El Greco, Rembrandt, Rubens, Tiepolo) and American artists (Eakins, Homer, Ryder, Whistler). Mr. Hyde passed away in 1934, but Mrs. Hyde tripled their collection over the next 30 years, adding more modern pieces by artists like Degas, Picasso, Renoir, and van Gogh. In 1952, she established a public trust and bequeathed her collection and her home to the community for the purpose of creating a museum. What resulted from the trust agreement was The Hyde Collection Art Museum, which first opened to the public in 1963 after Mrs. Hyde's death. Hyde House has always been the centerpiece of The Hyde Collection, which now includes exhibition galleries, classrooms, an auditorium, and outdoor gardens. The museum's permanent collection features approximately 3,000 works, and is constantly expanding with new purchases and gifts. The Hyde Collection continues to operate today with the mission Mrs. Hyde established, "to maintain a Museum for the exhibition of the permanent collection and to promote and cultivate the improvement of the fine arts, for the education and benefit of the residents of Glens Falls and vicinity and the general public." 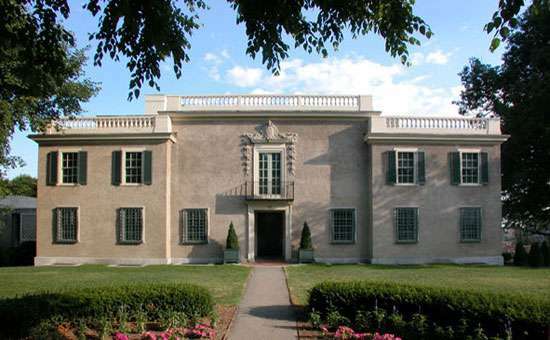 You can learn more about The Hyde Collection and see the historic homes of the Pruyn sisters for yourself by visiting the museum on Warren Street.